TOWER SITE CALENDAR 2008 - ALMOST SOLD OUT!!! *One of the legendary top 40 voices of the northeast has been silenced, far too young. "Big Ron" O'Brien, whose career included stops at Philadelphia's WFIL, WYXR/WLCE and WOGL and New York's WXLO, WNBC and WTJM, died Sunday morning (April 27) of complications from pneumonia. O'Brien began his broadcast career in 1969 at KUDL in Kansas City, and in the typical progression of the day, he quickly moved through Denver (KTLK), Chicago (WCFL) and Atlanta (WQXI). By 1974, he was in New York, doing nights at "99X," and by 1976 he was in Philadelphia at WFIL, where he spent three years. O'Brien then moved to Los Angeles, where he worked at KFI and KIIS, then to St. Louis and Denver (with a brief interlude at WNBC in the early 1980s) before returning to Philadelphia in 1996, where he worked at WYXR (104.5, later WLCE). In 1999, O'Brien was part of the inaugural airstaff at New York's WTJM (Jammin 105); in 2002, he joined Philadelphia's WOGL (98.1) for afternoon drive, and it was there that he remained for what turned out to be the last six years of his career. O'Brien had been ill for several months, WOGL says. He was just 56. *Elsewhere in PENNSYLVANIA, the sale of WNTJ (850 Johnstown) from Forever to Birach Broadcasting has closed, and as of midnight last night, the news-talk format that had been on 850 (and simulcast on WNTW 990 in Somerset) has moved back to its former home on 1490 in Johnstown. The 1490 signal, which holds the WPRR calls long heard in Altoona, has been running an all-sports format; it returned to Forever's hands last fall in a purchase from Nick Galli's 2510 group. The WNTJ calls will return to 1490 as well, probably later this week. So what happens now with 850? The $300,000 purchase by Birach includes not only the license for 850 (and for another Forever station, WCND 940 in Shelbyville, KY) but also the 115-acre tower site in Paint Township, Somerset County. Forever was reportedly eager to be free of the hassles of maintaining that nine-tower site, easily the most complex directional array in the northeast, and NERW suspects Birach isn't in this deal with the intent of maintaining the 10 kW DA-1 Johnstown signal on 850, either. Birach has interests elsewhere in the region (including WWCS 540 in Canonsburg, near Pittsburgh, and WTOR 770 Youngstown, NY, serving Toronto) - could the company have plans to move the Johnstown signal elsewhere? That would be a challenging task, since that nine-tower directional array shoehorns the Johnstown 850 into a tight squeeze between other 850 signals in Cleveland (WKNR) and Boston (WEEI), not to mention 860s in Pittsburgh, Philadelphia, Baltimore and Toronto and plenty of other nearby-on-the-dial stations that would need to be protected. In the meantime, there's a loop repeating over (and over and over) on 850 directing listeners up the dial to 1490 - and no indication at all on the WNTJ website that anything has changed. Speaking of complex directional arrays, Renda Broadcasting has just won FCC permission to begin construction of a new six-tower array on the Allegheny/Washington County line south of Pittsburgh, to be the new home of its WPTT, which has been granted its long-desired move from 1360 (licensed to McKeesport) to 910 (licensed to Mount Lebanon). The WPTT move is half of a frequency swap; religious WAVL (910 Apollo), northeast of Pittsburgh, was just granted its CP to move to 1360. WAVL will build a five-tower site east of Pittsburgh, bumping its power up from 5 kW days to 6.7 kW days and from 7 watts at night to 69 watts; WPTT will go from 5 kW days (non-directional from a tower near Pittsburgh's Squirrel Hill neighborhood) and 1 kW nights (directional from a four-tower array in McKeesport) to 7 kW, daytime-only, from the new 910 site. We'd expect to see some sort of application for night power on WPTT filed sooner or later. In eastern Pennsylvania, Nassau is converting its LMA of WFKB (107.5 Boyertown) to a sale. It'll pay WDAC Radio Company (which also owns WDAC 94.5 in Lancaster) $22 million for the station, which runs classic hits as "Frank FM." As part of the deal, Nassau agrees to continue carrying WDAC's religious programming on an HD subchannel of WFKB. And in our listing of regional stations that won awards at the NAB Show in Las Vegas, we left out a big one - Clear Channel's WUSL (98.9 Philadelphia) took home the inaugural Crystal Heritage Award, created to honor stations that have won five of the regular Crystal Radio Awards, most recently in 2007. 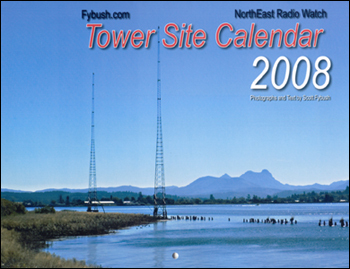 Still haven't ordered your 2008 Tower Site Calendar? You do realize that it's now...er...2008, don't you? We're already down to the last 40 or so calendars, and they're going fast. The 2006 and 2007 editions of the calendar sold out, and this one will do so as well, possibly as soon as this month. *NEW YORK's WOR (710) is apparently about to bring back one of the station's signature voices. John R. Gambling is the third generation of Gamblings in what had been an unbroken chain on WOR's "Rambling with Gambling" morning show from 1925 until the station fired him in 2000. Gambling resurfaced a year later on WABC (770), but lost his midmorning shift there in Citadel's budget cuts earlier this year. Now Allan Sniffen's New York Radio Message Board is reporting that WOR will bring Gambling back to morning drive, possibly as early as next week, alongside current morning host Joe Bartlett. The odd player out, apparently, will be Bartlett's current co-host Donna Hanover. WOR hasn't commented on the reports yet, but there's a news conference planned for Wednesday; we'll keep you posted. One of WOR's longtime news voices has died. Lester Smith came to New York in 1957 (on the same day the Dodgers left town), and spent most of the next two decades announcing news and sports on WOR radio and television. Smith died April 11; various reports had his age at either 90 or 91. There's a new market manager en route to the Citadel cluster in Syracuse (WNTQ, WAXQ, WLTI and WNSS). Dan Austin starts his new job in his hometown May 12, having just given his two weeks' notice at Albany Broadcasting, where he's been GM for the past five years. Speaking of Albany Broadcasting, there was some heavy-duty stunting going on all weekend at WZMR (104.9 Altamont), with the station running jockless and a repeated (and very clever) loop announcing, "Let's be FRANK... we're going to MIX things up. Kiss the secret and mystery goodbye. Things will go a lot Smoother. They told us we didn't know JACK or BOB. Should we just get MOVIN'? Guess we won't be the same old Channel anymore. A new STAR is coming. Things might be Bright, Hot, Sunny, Fresh, or even Kool.This has a Point... we'll Blaze through it. Find out what the Buzz is on Monday morning at 8 on FM 104.9." In Utica, WUMX (102.5 Rome) has named a new morning host to replace the now-cancelled "Wake Up with Whoopi" syndicated show. Sam Schrier heads east from Rochester, where he's been producing the morning show at WBEE-FM (92.5). Down the road from Binghamton, there's a new station on the air in Delhi. Double O Radio's WTBD (97.5) signed on last week, running a satellite-delivered adult hits format. *The big news in MASSACHUSETTS last week came from the TV management front, where WHDH-TV/WLVI VP/general manager Randi Goldklank was all over the tabloids after being arrested at Logan Airport following an incident during a flight last Sunday night. Goldklank told state police that a male passenger sitting next to her had been harassing her; Delta Airlines told police she had been acting "unruly" aboard the plane. A police report claimed Goldklank told the officers who met the plane, "I'll have a news crew down here in minutes and you will lose your (bleeping) jobs." Goldklank was arrested for disorderly conduct, resisting arrest and assault and battery on a police officer. She's on leave from the stations and apparently in rehab. At least for now, station owner Sunbeam Broadcasting is standing behind Goldklank, who was reportedly on medication for depression after the recent death of her mother. Former WHDH-TV general manager Mike Carson, who'd been consulting for the station, is back as interim VP/GM in Goldklank's absence. *One of Boston's best-known and longest-running sportscasters has died. Don Gillis began his career in radio, first at New Bedford's WBSM and then at Boston's WHDH, in the late forties, filling in for Red Sox announcer Curt Gowdy when illness kept him off the air for much of the 1957 season and hosting the "Voice of Sports" talk show, which set the stage for all the sports talk that would follow over the decades in Boston. When WHDH-TV (Channel 5) launched a nightly sportscast in 1962, Gillis was the station's first sports director, crafting the blueprint for local TV sports reporting. Gillis was the first sports anchor in Boston to have film clips during his reports, and he'll forever be remembered for his coverage of the Red Sox during their "Impossible Dream" season of 1967. When WHDH-TV folded a decade later and was replaced by the new WCVB on Channel 5, Gillis followed many of his colleagues out to Needham, becoming WCVB's sports director for its first decade on the air. Gillis retired as sports director of WCVB in 1982, but he stayed on as host of "Candlepin Bowling" on Saturday afternoons until the end of the show's run in 1996. Gillis died Wednesday (April 23) at his Cape Cod home. He was 85. *There's a new public radio station on the air in northwestern CONNECTICUT. Marshall Miles' Robin Hood Radio group, which leases WHDD (1020 Sharon) and operates a commercial full-service/variety format there, has been testing the new WHDD-FM (91.9 Sharon) and will formally launch the new station May 5. The directional class A signal (650 watts at 49 feet below average terrain) will carry a mixture of public radio programming (including Morning Edition from 5-6 AM and All Things Considered from 4-6 PM), as well as a simulcast of WHDD(AM)'s "Marshall and Mike" morning show from 6-9 AM. Miles says WHDD-FM is the first signal to make it on the air from the thousands of new noncommercial FMs granted in the window that the FCC opened last year; in fact, it appears WHDD-FM may be the second, after a new station in Alabama that signed on a couple of weeks ago. *Bob Bittner's Blue Jey Broadcasting is adding a second MAINE AM station to its holdings. The maverick station owner, best known for his listener-supported WJIB (740 Cambridge MA), is paying JJ Jeffrey's Atlantic Coast Radio $27,000 for WWBK (900 Brunswick), which Jeffrey has been operating as a simulcast of all-sports WJJB (1440 Westbrook)/WJJB-FM (95.5 Topsham). Bittner tells NERW he'll install a music format (the exact details as yet undetermined) on WWBK, separate from the standards/oldies format he's running on nearby WJTO (730 Bath). Will Bittner move WWBK from its present site in Brunswick (shared with Saga's WCLZ 98.9) to the WJTO site a few miles away? And there was yet another award from the NAB Show that we missed last week - veteran jock and station owner Bob "Doc" Fuller was honored with the Ward L. Quaal Pioneer Award by the Broadcasters Foundation of America. Fuller started on radio in his hometown of Newburyport, Massachusetts as a 16-year-old DJ on WNBP (a station he'd own much later in his career), then went on to Portland radio in the sixties as a jock at WJAB and WLOB. 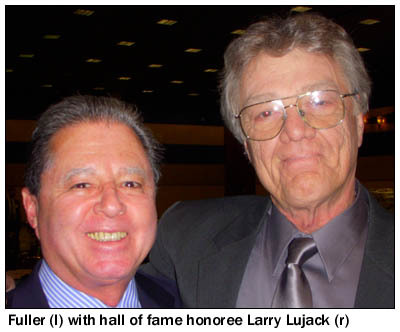 Fuller moved into ownership when he and J.J. Jeffrey bought WBLM (then on 107.5) in 1975. They grew their company, Fuller-Jeffrey, from that one station to a coast-to-coast group of more than 30 stations before selling the company in 1999. *The number-three network in French CANADA is changing owners and paring back its operations. Montreal-based Remstar acquired the TQS network out of bankruptcy earlier this year, and it's now asking the CRTC for permission to shut down the network's news operations as part of the relicensing process under the new ownership. Remstar says it can't afford to continue doing news, and it tells the CRTC that Quebec viewers are well-served by the province's other news sources, including dominant commercial network TVA and public broadcaster Radio-Canada. But its proposed changes (including cutting 271 jobs, more than half the network's staff) are facing political challenges from Quebec officials, who are likely to speak out against the Remstar application at a CRTC hearing June 2. TQS hopes to discontinue most of its newscasts in early June, leaving only two province-wide evening newscasts on the air through Sept. 1, when those, too, would be cancelled. Will the CRTC force Remstar to keep the TQS news operation alive, or even to undo the purchase of the network? We'll be following this process closely. Meanwhile, there's another TQS-related transaction on the CRTC's agenda, as Remstar seeks to sell the three Radio-Canada affiliates that it's been operating alongside its own TQS stations in Sherbrooke, Trois-Rivieres and Saguenay. Radio-Canada itself hopes to buy CKSH (Channel 9) in Sherbrooke, CKTM (Channel 13) in Trois-Rivieres and CKTV (Channel 12) in Saguenay from TQS, which ended up with the stations when their former owner, Cogeco, bought into the TQS network. Radio-Canada has been handling most aspects of the stations' operations for the last few years, running them as semi-satellites of network flagship CBFT (Channel 2) in Montreal. In Ottawa, Gord "Gordman" Taylor has departed the PD chair at CKQB (106.9 the Bear) after 21 years at the station and its predecessor, CJSB (540 Rock). No replacement has been named yet. On the Ottawa TV dial, Sun TV (CKXT) hopes to change channels on its DTV transmitter. CKXT-DT's Ottawa transmitter now operates on channel 62, but it's applying to move to channel 20, sharing an antenna with TVOntario. An unusual radio fundraising campaign in MASSACHUSETTS has wrapped up with an early declaration of success. As we've amply chronicled over the years, WJIB (740 Cambridge) is a most unusual commercial station, operated as a one-man venture by owner Bob Bittner, who's run the station for the last decade and a half with no commercial spots at all, just some leased-time programming and a lot of standards, soft AC, oldies and good old-fashioned "beautiful music." Two financial blows to WJIB almost put that operation in jeopardy this spring: first, the loss of Radio France International's contract to lease two hours of morning drive, and second, WJIB's ratings spike that put it in danger of owing a much larger ASCAP/BMI bill than it's enjoyed over the years with ratings below 1.0. So Bob decided to ask his audience for their support. Six weeks ago, he began airing occasional messages gently asking for voluntary donations to keep WJIB going past his self-imposed June 30 deadline. It turns out, as Bob put it in his on-air announcements last Wednesday, that June 30th came early - and that he's already made his $88,000 goal after just six weeks of occasional on-air fundraising announcements. "I am impressed with your generosity, and your deep commitment to keep WJIB playing this great music that we're known for," Bittner said in his announcement. "And I feel really good too; that all of my work over the years selecting and putting this music together has been validated." Bittner says the over 2,400 contributions he received - not tax-deductible, by the way - ranged from $5 to two $1,000 checks, and that not a single check bounced. (Two, however, sent in checks made out to "WGBH"!) And he says his experience proves that "a smaller commercially-licensed station has another alternative than to scratch for limited advertising dollars," providing another possible path for niche music formats like his to succeed. In Worcester, WTAG (580) morning host Hank Stolz left the Clear Channel station last week, just after celebrating his tenth anniversary there on Monday, but he's not disappearing from central Massachusetts morning radio. On Wednesday, competing talker WCRN (830) announced that it's hired Stolz as its new mid-morning talk host. He'll debut there today with "The Hank Stolz Experience," to be heard weekdays from 9 AM-noon, immediately following WCRN's Peter Blute morning show. Stolz's show replaces the leased-time "Money Matters" show in that slot, and it gives WCRN a live-and-local lineup all morning long. Meanwhile at WTAG, Stolz's co-host Sherman Whitman continues in morning drive. In NEW JERSEY, the David Sarnoff Library in Princeton took a pounding from the nor'easter that hit the region April 15. The storm deposited 20 inches of water in the building's sub-basement, soaking 600 cubic feet of boxes that contained records from the RCA Labs dating from World War II to 1960, including notebooks documenting the development of the company's early television cameras and satellite communications.The library's insurance doesn't cover the estimated $60,000 cost of drying and restoring the documents, work that's now underway at Document Reprocessors in Middlesex, New York (just down the road from NERW's Rochester headquarters), and the library is looking for donations to help pay for the restoration work. Just in to NERW is word that Jerry Williams has died. The dean of Boston talk radio, Williams came to town in 1957, already a decade into a career that began in Bristol, Virginia in 1946. At Mac Richmond's WMEX (1510), Williams' night shift was a sharp departure from the top 40 the station played the rest of the day. When Williams took the air at 10 PM, WMEX turned into Boston's first talk station, as Williams interviewed the newsmakers of the day and took listeners' phone calls. In 1965, Williams departed for Chicago's WBBM, but he was back in town four years later, bringing his talk show back to the nighttime airwaves at WBZ (1030), where he stayed until October 1976, when he headed to New York for a brief stint at WMCA (570), followed by four years at Philadelphia's WWDB (96.5). In 1981, Williams was back on the air again in Boston as part of the original talk lineup at WRKO (680), the station that was once WMEX's competitor in the waning days of AM top 40. Williams, now ensconced in an afternoon drive shift, quickly became the best-known and most controversial talker in town, using his show as a forum to oppose mandatory seat belt laws and, most memorably, to support a 1990 tax revolt (launching, in the process, the political careers of Barbara Anderson of Citizens for Limited Taxation - not to mention the radio career of the Herald's Howie Carr, who would later make that WRKO shift his own). In 1994, Carr replaced Williams in the afternoon, with the veteran host moving to mid-mornings on WRKO (a shift he derided as "The World's Shortest Talk Show"); by January 1997, Williams had been relegated to a weekend slot, and by 1998 he was gone from WRKO and living in retirement on the South Shore. Williams couldn't stay silent for long, though. In January 2000, he resurfaced as part of an ambitious talk lineup on the "new" WMEX (1060 Natick), but health problems got in the way, and he was off the air there within two months. A stroke in April 2001 further weakened him, but not enough to keep him from trying a daily show on WROL (950 Boston) last December and even making a return to WRKO to do some weekend fill-in this past February. Boston has lost one of its legendary broadcasters. Carl DeSuze died Wednesday night at the age of 83. DeSuze was WBZ's morning host from the 1940s until the early 1980s, a record that's unlikely ever to be broken. His urbane on-air manner and affection for all things European made for an unlikely fit with WBZ's top-40 format in the sixties, but the combination worked, and DeSuze remained on top of the ratings for years. In addition to his duties as "New England's Alarm Clock," DeSuze traveled the world, relating his experiences in lectures across New England. A Maine native, DeSuze was proud of his Bowdoin education. After college, he worked at several Maine radio stations before moving to Boston and WBZ. On a personal note, your editor had the opportunity to work with DeSuze while helping to prepare WBZ's 75th anniversary celebration in 1996. While DeSuze's health was already failing, he was eager to share his memories and his memorabilia. I'll long treasure the memory of spending several afternoons at his home in Concord, as he sifted through several boxes of photos and posters, recounting the stories of celebrities interviewed and distant capitals visited. DeSuze's death follows that of Gordon Swan by only a few months; together, they represented an era of WBZ history that's now all but lost. On we go to NEW YORK, where WTOR (770 Youngstown) is reportedly testing, and has now applied for a license to cover. Another 770 in WABC's home state? You bet, since Youngstown is just north of Niagara Falls, as far away from New York City as you can get in the Empire State, and this 770 will be a daytimer with a directional signal pointed straight out over Lake Ontario, towards Toronto, hence the calls. NERW will be making the drive to Youngstown this weekend; more on this one next week. And we mourn the passing of two veteran broadcast engineers. Charlie Hallinan died last Wednesday at his home in Binghamton. Hallinan was one of the founders of the Society of Broadcast Engineers, and built many of the Southern Tier's radio stations. And Mike Venditti of Cherry Hill, N.J. died at home on Monday. Venditti was a legend in the world of superpower AM, having rebuilt border blaster XERF (1570 Ciudad Acuna, Mexico) in the 1970s and returned it to the air. Over the years, Mike built 57 AM stations. He'll be deeply missed.